Rome never fell. It became Byzantium … As Ottoman forces invade, one man must defend his country and face his own personal destiny. A rich tale of clashing empires and trade wars, lost treasure and tempestuous love in an age when the fate of the world hung on the survival of Byzantium. It was an era that made the modern world and a place that was then, as now, the hinge between east and west. Luke Magoris, descendant of princes of England, is a man with a rare talent for war and for trade. To him falls the overwhelming task of defending his country and his beloved Mistra against the rampant Ottoman forces. Oswald de Lacy is growing up fast in his new position as Lord of Somershill Manor. The Black Death changed many things, and just as it took away his father and elder brothers, leaving Oswald to be recalled from the monastery where he expected to spend his life, so it has taken many of his villagers and servants. However, there is still the same amount of work to be done in the farms and fields, and the few people left to do it think they should be paid more – something the King himself has forbidden. Just as anger begins to spread, the story of the Butcher Bird takes flight. People claim to have witnessed a huge creature in the skies. A new-born baby is found impaled on a thorn bush. And then more children disappear. Convinced the bird is just a superstitious rumour, Oswald must discover what is really happening. He can expect no help from his snobbish mother and his scheming sister Clemence, who is determined to protect her own child, but happy to neglect her step-daughters. From the plague-ruined villages of Kent to the thief-infested streets of London and the luxurious bedchamber of a bewitching lady, Oswald’s journey is full of danger, dark intrigue and shocking revelations. 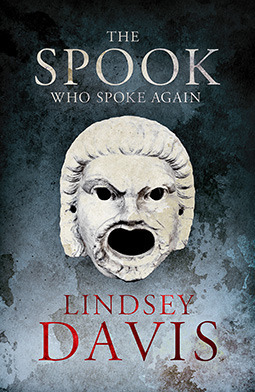 From renowned author Lindsey Davis, creator of the much-loved character, Marcus Didius Falco and his friends and family, comes the fourth novel in her all-new series set in ancient Rome. We first met Flavia Albia, Falco’s feisty adopted daughter, in The Ides of April. Albia is a remarkable woman in what is very much a man’s world: young, widowed and fiercely independent, she lives alone on the Aventine Hill in Rome and makes a good living as a hired investigator. An outsider in more ways than one, Albia has unique insight into life in ancient Rome, and she puts it to good use going places no man could go, and asking questions no man could ask. Eden Gardens, Calcutta, the 1940s. In a ramshackle house, streets away from the grand colonial mansions of the British, live Maisy, her Mam and their ayah, Pushpa. Whiskey-fuelled and poverty-stricken, Mam entertains officers in the night – a disgrace to British India. All hopes are on beautiful Maisy to restore their good fortune. But Maisy’s more at home in the city’s forbidden alleyways, eating bazaar food and speaking Bengali with Pushpa, than dancing in glittering ballrooms with potential husbands. Then one day Maisy’s tutor falls ill. His son stands in. Poetic, handsome and ambitious for an independent India, Sunil Banerjee promises Maisy the world. This is the other side of British India. A dizzying, scandalous, dangerous world, where race, class and gender divide and rule. David Churchill’s The Leopards of Normandy trilogy continues with Duke, as William of Normandy inherits his father’s title and assumes command of his lands. Sparks fly from clashing swords as the game of thrones plays out in bloodshed. Of those named guardian to the boy Duke, all seek advantage and power. Most wish the boy dead. Some will go to any lengths to make it happen. Across the sea, the struggle for the English crown has seen Queen Emma’s beloved son killed. She has two more sons waiting in the wings but Godwin, Earl of Wessex – kingmaker and arch manipulator – has other plans. As the noble families of Europe murder each other in their lust for power and fortune, the boy stands apart. His name is William. His destiny is to conquer. If war is madness, how can love survive? Yugoslavia, summer 1979. A new village. A new life. But eight-year-old Miro knows the real reason why his family moved from the inland city of Knin to the sunkissed village of Ljeta on the Dalmatian Coast, a tragedy he tries desperately to forget. The Ljeta years are happy ones, though, and when he marries his childhood sweetheart, and they have a baby daughter, it seems as though life is perfect. However, storm clouds are gathering above Yugoslavia. War breaks out, and one split-second decision destroys the life Miro has managed to build. Driven by anger and grief, he flees to Dubrovnik, plunging himself into the hard-bitten world of international war reporters. There begins a journey that will take him ever deeper into danger: from Dubrovnik, to Sarajevo, to the worst atrocities of war-torn Bosnia, Miro realises that even if he survives, there can be no way back to his earlier life. The war will change him, and everyone he loves, forever.